Pours a very dark amber close to brown, clear with dark copper hues. There is a light tan head. The head looked pretty rich and I thought it would hang around for a while but it didn’t. There is a nice film on top of the beer with a lingering ring around the sides of the glass with some lacing. Nice aroma of dark roasted malts, almost Belgian like, rich nutty chocolate notes with sweetness. 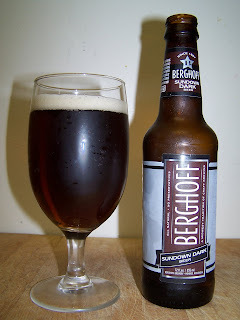 Wow I saved the best of these Berghoff beers for last. This is a very nice well crafted beer. It starts with a sweet roasty malt flavors a nice tingly carbonation on the tongue and then more malty goodness on the back end. Surprisingly enough it has a drier finish than you would expect with all that maltines. There is a very low hop bitterness just enough to balance and provide a dryer finish. It has a smooth rich maltiness but it is also a very refreshing beer. That maybe due to the carbonation. There is nothing outstanding with this beer it’s just well done. Let’s see what it does after it warms up a little. This beer is at 61 degrees now, there is more bitterness on the back end but it is still very pleasant to drink. This is a solid B, I really like this beer. I am getting a little concerned about all the beer you've been drinking. So I would be willing to be your sponsor if you ever decide to quit. OH when I mean sponsor. I would drink them for you and let you know how they rate. Gee thanks for the offer. I thought the sponsor would help purchase the beers for me. That would make the spouse happy. These beers were consumed over the last few weeks I just posted them close together. Honest, I don’t’ have a drinking problem well not really. Plus I have 3 more to edit and post. No, no problem here.